This entry was posted in Cats, Max, Stable by Country lover. Bookmark the permalink. Loved your piece on the Joys of Country Living, especially the photo of the chicken keeping warm inside while you struggle to the office and of Max wanting to be in the warm. Thanks Val for your kind words re my last post. The previous post, Two Little Miracles, was such a special story to me, I felt that anything that followed it would seem very mundane. But life is like that I suppose, we can’t have exciting things happen to us every day. Life is mostly made up with the mundane. But maybe that’s just as well, because it really makes us appreciate the special things when they come along! My Sister keeps Chickens and Rabbits and my Dad is a Bee Keeper (hence HonieB). We used to have loads of animals in our old family home on the edge of the valley but it’s more modern living on the edge of the village by the fields now. Still very windy with all the joys of the severity of what the wind brings in (flying wheelie bins as well as deeper snow), but 2 cats (as unique as they are) are not quite the same as the equilalent of a ‘small farm’. I thought it was funny when Tilly Tiger Socks and Nochi Blue Boy stood at the front door last week to ‘view’ the snow (reluctantly), but a short time later, they discovered how much fun it was: digging it up; throwing it up and catching it; running and sliding in it and their favourite game – tumbling with each other and skipping (very high) over each other’s backs in the garden. They now cry to go out when it snows! I don’t have catflaps, as there are a lot of cats nearby and I don’t fancy holding the local Cat Club. Also because of their breeds, they were initially house cats and I’ve given in to letting them out a few hours in the morning and later in the day (they have a routine, which they ‘mostly’ stick to). I loved reading your post and your ‘as it happened’ account of your morning. I could imagine you cursing and huffing as you ploughed on with your morning tasks. I shall never complain about getting the kids ready in the warm again lol. 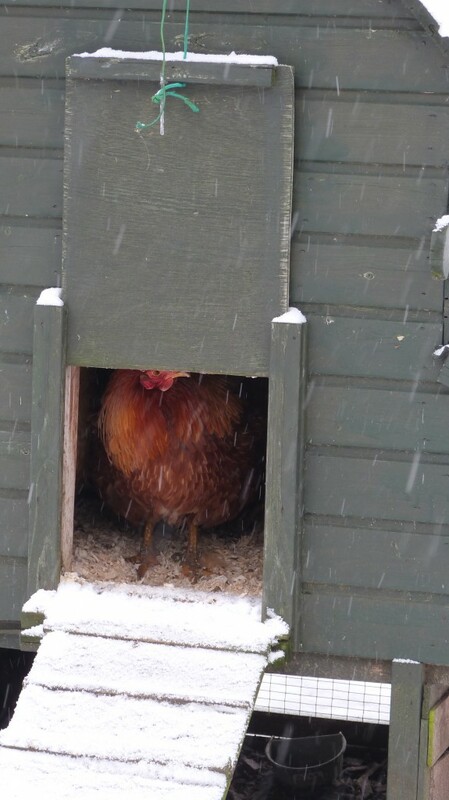 It was your picture of the hens that reminded me of my cats at the door, reluctantly looking out at the snow (pic on Facebook). We had a break from the snow up here in the shelter of the Pennines, but here it comes again, Amber warning cries out – get ready for the chaos! How interesting that you come from a small farm background – You will understand the hardships involved in having animals in the winter. It really is (s)no(w) joke! I have never known it so cold, when padlocks, car doors, stable buckets, everything frozen solid. That particular night it was -14 degrees, which my outside thermometer has never registered before. It must be lovely to watch your cats frolicking in the snow. Minnie and Maisie, despite being sisters, are no longer close. The same thing happened as my two previous cats, brothers, once they grew up. One of them is always jealous of the other because they get on my lap first, or their sixth sense tells them that their brother/sister is my favourite. I hate the idea of having favourites, but one always seems to be more affectionate, or needs to be close to me more than the other. Last year I installed a brilliant catflap that only lets my cats in. Both cats are microchipped and all you have to do is input their microchip number into the catflap, and it will only let them in. We had the neighbourhood tom coming in, and traumatising them and eating their food. Now it is cat heaven with no intruders! Certainly worth the £65 or so it cost me. Thanks so much for your visit, tis much appreciated! Just discovered your blog, what a great read! 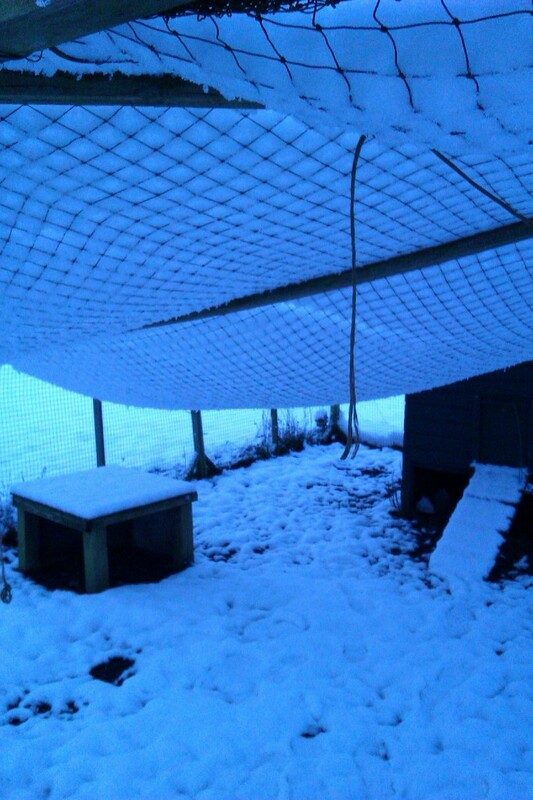 We too struggled last week with the very low temperatures and snowfall – made the tasks of caring for my two dogs, and especially our 6 sheep and 2 ducks (one of them very elderly) even more time consuming. Thankfully the thaw has helped reinstate our daily routine – yet our stream is very high now and of course the high water levels are bringing with them a whole host of other problems! Hello Chloe, how lovely that you have visited my blog. 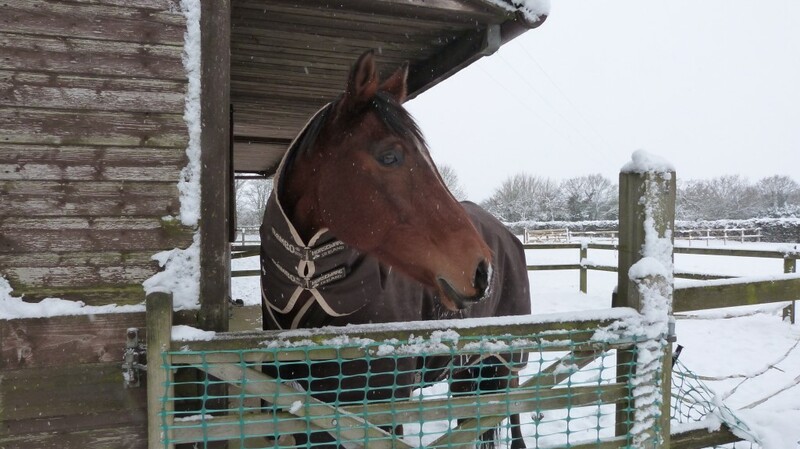 Your comment is much appreciated as somebody who understands what it is like coping with animals outside when the weather is so cold. It is a constant struggle, but I wouldn’t have it any other way. The animals bring so much pleasure, it’s the least I can do to look after there every need! Do hope that your stream doesn’t flood your land. Am lucky, in a way, as I have no running water near my immediate land. My meadow is surrounded by ditches that were running quite high this morning, but no fear of flooding thank goodness. Max is the most beautiful horse ever, he looks like he has an expressive face? He’s my loveliboi, such a sweetie, though he can be naughty sometimes. So sensitive, a real people horse i.e. really locks onto humans. Doesn’t seem at all troubled that he doesn’t have equine company. Why should he, he has me! Often laugh at him… think he’d come and sit in front of the wood burner with me if he could.